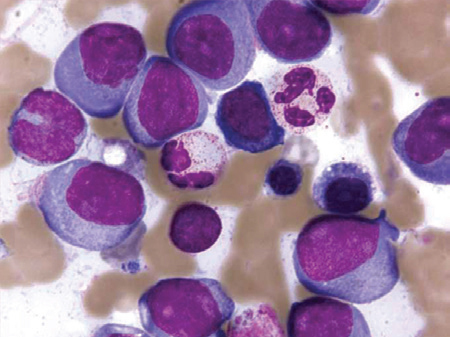 Hematopathology is involved in the analysis of the cellular elements of blood, bone marrow, body fluids, and lymphoid tissues with a focus on neoplastic and non-neoplastic hematologic disorders. In addition to high-volume automated hematology laboratory tests (e.g. CBCs), the Hematopathology laboratories perform a wide variety of specialized studies such as hemoglobin variant analysis and red cell membrane disorders. The facilities and expertise of this section allow for a comprehensive approach to the interpretation and diagnosis of blood, bone marrow, and lymph node specimens. Morphologic findings are integrated with the results of special procedures such as immunohistochemistry, flow cytometry, molecular studies, and cytogenetic analysis to arrive at a final interpretation. Molecular hematopathology analyses routinely performed include polymerase chain reaction amplification for immune receptor gene rearrangements and fluorescent in situ hybridization for genetic translocations. The Flow Cytometry Laboratory provides a full range of services for the assessment of leukemias and lymphomas, immunodeficiency states, transplantation immunosuppression status, DNA ploidy, and paroxysmal nocturnal hemoglobinuria. Full consultation (includes flow cytometry and morphologic interpretation). “Special Procedures Only” (numerical values are provided for client interpretation in conjunction with other available information). Please see the Test Directory for guidelines on specimen preparation and handling. For specific test information, please contact Client Services. Cleveland Clinic Laboratories offers a full range of expert consultative services for bone marrow evaluation and interpretation. Full morphologic interpretation of bone marrow specimens by a staff hematopathologist is available. Services include: evaluation of prepared peripheral blood smears, bone marrow aspirate smears, touch imprints, core biopsies and clot sections (if available). In some cases, additional studies may be performed on this material such as cytochemistry, immunohistochemistry or molecular studies at the discretion of the pathologist. Please see the Test Directory for more information. Flow cytometric immunophenotyping services are available on bone marrow samples for the evaluation of suspected hematologic malignancy. This includes a morphologic review of submitted stained or unstained aspirate smears along with four-color flow cytometric analysis and interpretation by a staff hematopathologist. This review includes an initial morphologic evaluation to determine the appropriateness of the panel requested. For more information, please refer to flow cytometry in the test directory. Cleveland Clinic Laboratories offers comprehensive, expert consultative services for the evaluation of lymphoproliferative disorders. A full range of ancillary techniques (flow cytometric immunophenotyping, immunohistochemistry, and molecular diagnostics) is available. Clients may send fresh tissue in tissue culture medium for flow cytometric immunophenotyping. When routinely processed tissue is available, histologic slides and paraffin blocks are forwarded for evaluation and diagnosis. Refer to flow cytometry and surgical pathology in the Test Directory for more information. Specimens (slides and tissue blocks) may be sent for diagnostic consultation. Ancillary studies will be performed (immunohistochemistry, molecular diagnostics) if required. Refer to surgical pathology section in the Test Directory for more information. Specimens may be sent fresh in tissue culture medium for flow cytometric immunophenotyping with interpretation by a staff hematopathologist.